Today, I've had the rare and rather satisfying experience of attending a book launch by one of my past students. 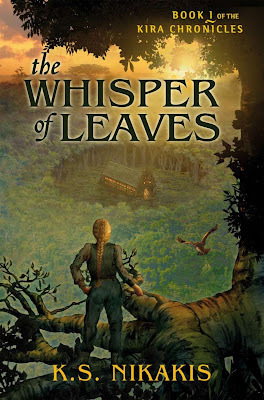 Karen Simpson Nikakis was one of my Novel 2 students and launched her new fantasy series The whisper of leaves, Book 1 of The Kira Chronicles. I had an interesting chat to Louise (who'd come down from Sydney for the launch, and to attend the Melbourne Writers' Festival) about Karen, fantasy writing, teaching writing, and publishing in general. She thought it was great that at least one writing teacher out there loved fantasy, and I spoke about friends who've studied writing and are forced to write only literary fiction. I really can't see the point in this -- for two reasons: (i) literary fiction doesn't sell, and (ii) writers should be writing what they're passionate about. Karen is passionate about fantasy -- she has followed her dream and now it's paying off, and that should be heartening for all writers! Professor John McLaren (former VU academic and editor of Overland) launched the novel, and made an interesting speech about the importance and value of fantasy in our lives, which was good for me to hear because sometimes in the SF community that I inhabit there is the pervading opinion about how academics perceive speculative fiction, and it's nice to be reminded that not everyone is as polarised in their views. I mean, it always amuses me how magic realism is viewed as respectable, and yet its close kin fantasy is deemed rubbish. He also spoke about the richness of the world that Karen invokes, richness both in detail and in language, and how love permeates it all -- and it again made me think of the divisions between science fiction writing and fantasy writing: the head versus the heart. Karen's speech was warm and gracious -- and without being at all longwinded, she managed to thank everyone there (I think! ), and gave our course a plug, which was nice. It's great to see a writer whose family is behind them -- hers seemed suitably excited. Here's a photo of Karen and her kids with her new book (I just wish my camera program filtered out the red-eye, the way it says it does!). I hope Karen's new book (and indeed the trilogy) and Louise's new imprint both do spectacularly well! That "Friday pitch" thing looks fantastic. I wonder whether it will influence people to submit there before anywhere else? The promise of feedback within a week is tantalising. Yes, I think it's an excellent concept, and it's great for Karen that she was first!